Connecticut artist, Jonathan Brand, is fascinated with taking things apart and putting them back together in a form previously unimagined. Focusing his work on the transportation, migration, and adaptation themes, he uses paper and other crafty materials to construct full sculptural installations of boats and cars, including the classic Mustang. His meticulous processes often compels the viewer to ruminate on the mechanical aspects of the art itself. Recently, he has triumphed a domain few artists have yet to even enter: 3D printing. What made you decide to create using 3D printing? I like new technologies and have a real fascination with machines and mechanical devices. These interests naturally led me to 3D printing. The results can be both extremely beautiful and satisfying, but the process is at times extremely limiting and frustrating. 3D printing is a very fresh and new form to enter the art world; could you describe your process of 3D printing the motorcycle? I begin every new project with a challenge that I propose to myself and have a general vision of the outcome. 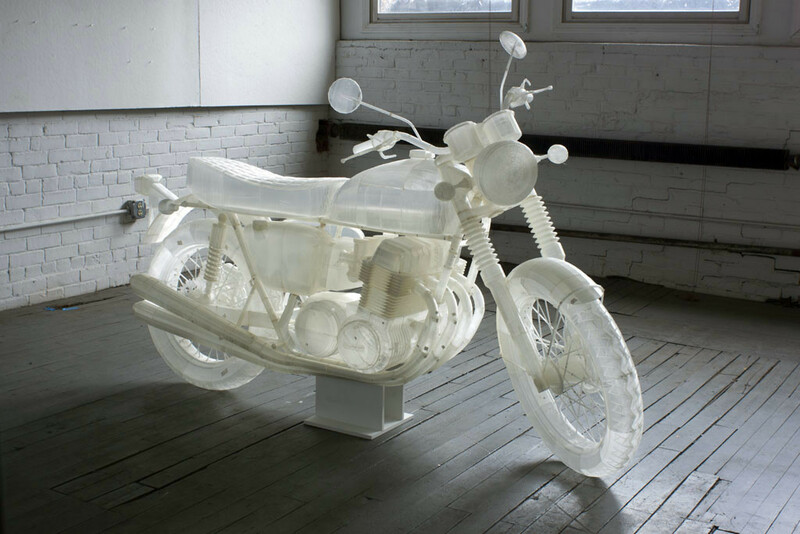 In this instance, 3D printing a translucent full scale motorcycle. Some things end up as planned, but there is also a lot of adapting and responsive problem solving in the process. For the Motorcycle project, I started by buying a 3D model to use as a template. Because this model was low resolution I used it to redraw a lot of the parts from internet photos or by collecting already made files from online. The finished motorcycle is a combination of different early 1970’s Honda motorcycles. Each part had to be cut into smaller pieces in order to fit on the 3D printer. For example, there are 8 prints in the seat. Each piece was numbered so that I could later assemble it. The pieces are welded together using a soldering iron. I had to do a lot of sanding, filing, and cutting to get all the parts together. Clearly you spend a lot of your time working on sculpture, but you also have a lot of talent in other art forms (film and drawing). Would you say you prefer working in sculpture, if so, why? Recently my work has focused on specific objects from my life, and as a result of recreating those objects, sculpture has been my main focus. As my work begins to branch out and deal with other themes I find myself increasingly returning to other art forms. I’m always open to using whatever means necessary to tell a story. 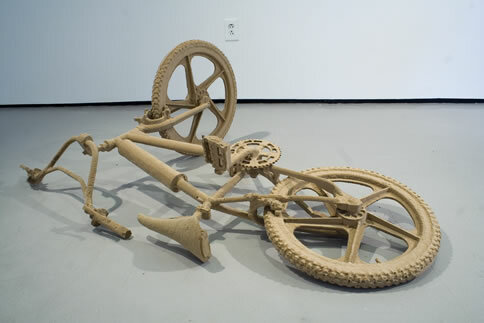 Fallen, a carved MDF copy of my childhood bicycle. It was the first object in my current vein dealing with the attempt to reconnect with objects, often in absurd or roundabout ways. I try to bring into form things that I can’t otherwise access, in this case my childhood bicycle. Jonathan Brand’s work has been featured across the globe; exhibitions including The Bronx Museum of the Arts, The Queens Museum of Art, The Aldrich Contemporary Art Museum, Martha Otero Gallery Los Angeles, Hosfelt Gallery New York, among others.